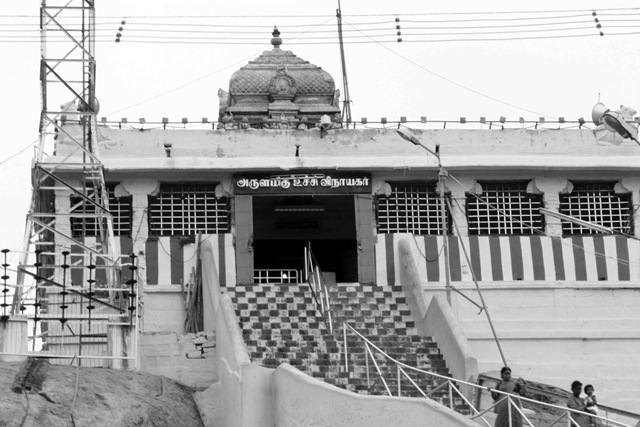 Located at the top of Rockford, Trichy, is the shrine of Malaikottai Uchchi Pillayar Ganesh. 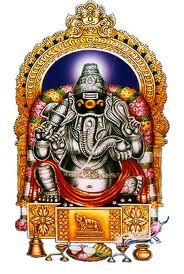 This temple was constructed during the seventh century and Lord Ganesha is worshipped here. While Lord Rama was returning to the village of Ayodhya after saving Sita, his wife, from the hands of Ravana, He was accompanied by Sugriva, Lord Hanuman and Vibishana who came to take part in his coronation ceremony. While he was returning Sri Ranganatha deity that he had received in the form of a gift from Rama, Vibishana reached the south. Admiring how beautiful Cauvery River, as well as the environment there was, he wished to rest for some time, there. What he did not know was that, Vinayaka was present there, he was in the avatar of a small boy, he told the him to guard the gift that he had recieved. While he was staying put for Vibishana, he put the diety on the earth and hid inside the mountain. The boy had disappeared, and he could not find him anywhere. He used all the strength he possessed to shift the deity from its place, but couldn't succeed. 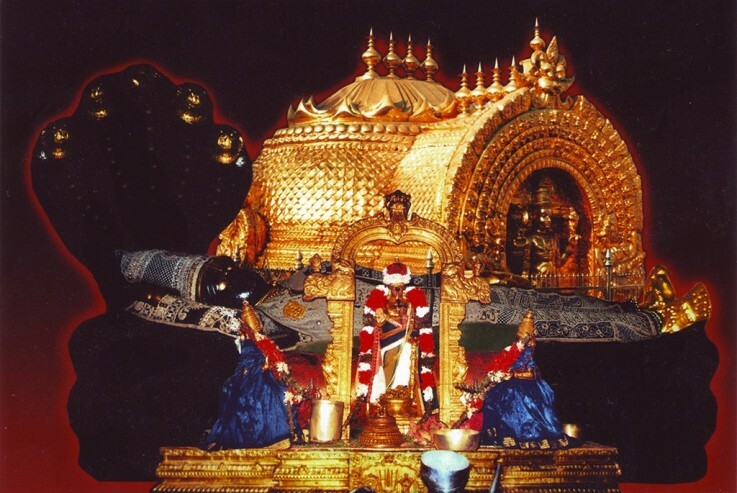 As a result of this, Lord Ranganatha, who was actually from Sri Lanka, had to abort his expedition and chose the village of Sri Rangam, in the form of his new home. When he saw him standing atop the mountain, Vibishana injured him, on his cranium the mark caused by the same, can be seen on the deity of Vinayaka even today. 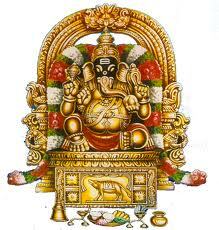 Hence, we know that Lord Vinayaka, as well as Lord Ranganatha who is also located close by is watching over us. 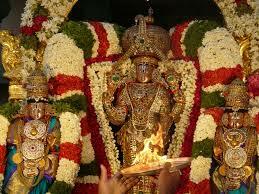 All Saivite saints like Gnanasambandar, Swamigal and many others have praised this holy land. The construction of the hill is a wonder of engineering. There are two engraved caverns on the hill; the upper one is a treasure of monumental minutae, while the lower one contains hundred and four divine verses in Andhadhi style. 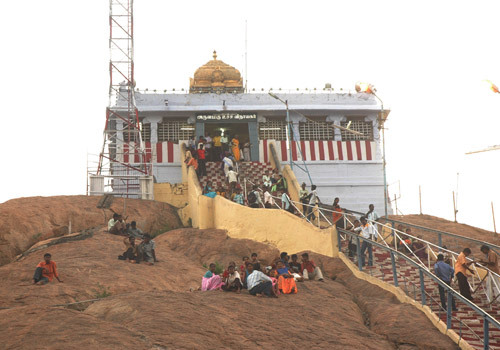 One can view the entire city of Tiruchi by standing atop of the mountain. One needs to climb approximately four hundred and seventeen steps to get to the temple. The mandap, which is constructed with the help of a thousand pillars in the temple, is rather magnificent and wedding cermomies are performed here. Devotees flock the temple and offer abishek to the Lord by using milk, they also offer grass garlands called Arugampul to Him. Any ceremony or event, be it related to one's personal life, religious life or professional life, that is carried forward after praying to the Lord is always met with success A number of festivals are celebrated here, Chithirai, a festival that lasts for five days, which is a car festival is celebrated here, during the months of April and May. During the months of March to April, The festival of Teppa Thiruvizha is celebrated here by the people, this festival lasts for twelve days. Between the months of May and June, the summer festival of the hills is organized here by the devotees, here. The festival of Navarathri is celebrated during the months of September to October; whereas celebrations for the festival of Skanda Sashti are carried out during the months of October and November. Besides these, Tamil and English New Year days, as well as the festivals of Diwali and Pongal are also celebrated by performing special Pujas.